One of my favorite CDs to listen to while my hour long commute is “Maracas, Marimbas & Mambos: Latin Classics At M-G-M.” Along with ballads performed by Colombian singer Carlos Ramierz and toe tapping, show stoppers by Carmen Miranda, one of my favorite 1940s bandleaders multiple times on this album: Xavier Cugat. From the fun and humorous “Take it Easy” from “Two Girls and A Sailor” (1944) to the bouncing “Walter Winchell Rumba,” Cugat’s songs are jaunty and full of spirit. What do you think of when you hear “1940s culture”? Big band music performed by the likes of Glenn Miller or Tommy Dorsey with teens swing dancing and Frank Sinatra crooning? Though big band and swing seem to characterize the popular perception of World War II era United States, one of the biggest fads in the United States in the 1940’s was Latin and Spanish culture. 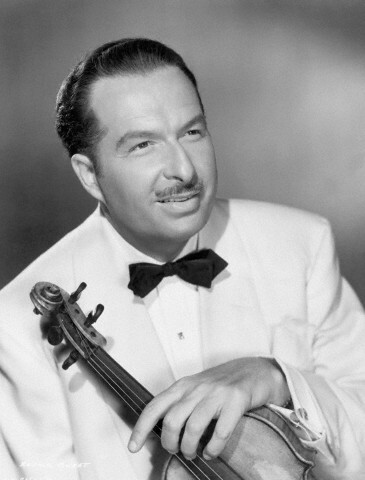 Throughout the mid-1930s through the early-1950s, Hispanic themed music was popular and Xavier Cugat was the Rumba King. Cugat, nicknamed Cugie, was arguably was the top Hispanic bandleader during this time, popularizing the rumba in the United States. 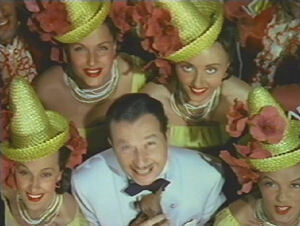 Cugat’s popularity landed him into 17 Hollywood films, including “Luxury Liner” and “Holiday in Mexico” with Jane Powell, and “Thrill of Romance,” “Bathing Beauty” and “On an Island with You” with Esther Williams. In most of his film appearances, Cugat was accompanied by his female singer, Lina Romay. Cugat’s trademark was directing his musicians with his violin in one hand while holding a chihuahua in the other. Other times he may sketch a quick drawing while directing. Along with Cugat, other hispanic performers would be featured, but each had their own musical style and none overlapped. Carmen Miranda’s numbers were colorful and often comical, characterized by her detailed and elaborate costumes. Pianist José Iturbi would be featured playing classical pieces, sometimes accompanied by his sister Amparo. To a lesser degree, in most 1940s films, if the stars are in a nightclub, you bet they will be doing a rumba at one point. In “A Date with Judy” (1948) Carmen Miranda teaches Wallace Beery how to rumba so he can dance with his wife, Selena Royal, for their anniversary. Even Charles Laughton was doing the rumba with Deanna Durbin in “It Started with Eve” (1941). But this Hispanic influence didn’t stop at the music during this time period: It translated into clothing, film themes and dances. The Spanish and Latin influence was not just limited to night club entertainment but also rubbed off on fashion. Popular 1940s summer fashions were influenced by Latin culture with peasant blouses, colorful fiesta skirts and espadrille shoes. Jane Powell can be seen wearing this style in wore a in “Luxury Liner” (1948). 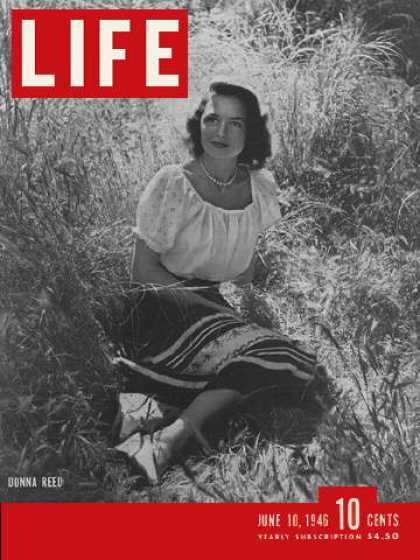 The July 17, 1944, LIFE magazine cover features a model wearing what was known as the “Peasant Clothes.” She is wearing a lose, capped sleeve blouse, a flared striped skirt and wedged hemp shoes. Other movies like “Gilda” (1946) or “Romance on the High Seas” (1948) are located in South America and take part in Carnival. Why was this Hispanic influence huge in United States pop culture? Specifically with stars like Brazilian Carmen Miranda, her job was to star in patriotic films such as “The Gang’s All Here” to bridge the gap between the Americas. However, the policy declined in 1945 after World War II ended and the Cold War began. Cugat remained popular throughout the 1950s, but much like big band performers like Harry James or Tommy Dorsey, his popularity faded as the rumbas and dance music were less relevant and rock n’ roll started to emerge. He retired in 1971 after suffering a stroke. This is part of the Hollywood Hispanic Heritage Blogathon with Aurora’s Gin Joint. Check out the Comet Over Hollywood Facebook page for the latest updates. Contact us at cometoverhollywood@gmail.com or @HollywoodComet on Twitter. This entry was posted in Reviews and tagged 1940s spanish, Down Argentine Way, Holiday in Mexico, Latin fad, rumba, The RUmba King, Thrill in Brazil, Weekend in Havana, Xavier Cugat by Jnpickens. Bookmark the permalink. I know this comment is probably coming in late, but reading this post made me think of the good neighbor policy which was practiced by the US government towards Latin Americaduring that time. I think if you read about that policy you might be able to find a few possible answers to your questions. I learned about it in a U.S. Latin American relations class here at Winthrop. You know, I didn’t even think about the Good Neighbor Policy, but you are probably right. I know that the government liked Carmen Miranda because they sort of viewed her as an “ambassador” for the good neighbor policy. Very interesting. Appreciated your obituary tribute to Lina Romay. I have been a devotee of the pre-1950 Xavier Cugat since 1961. I bought some Cugat Columbia 78’s with Lina on them during the 1960’s, and more of them later on. I think that she sang on one or two during the last Victor session (1940). Cugat’s greatest female vocalist was the Mexican Carmen Castillo [now mistakenly considered his second wife] during his first period, before he went beyond ethnic limitations. Allow me, please, to point out that the western movies, even before Gene and Roy, played a pioneering role in bringing a favorable image at least of Mexico to the United States audiences. For me there is nothing more moving than Gene singing “South of the Border”, and the film itself. Cugat was really great I think. I’m not sure if I have ever heard Castillo, but I will certainly need to look her up now. I’m a huge fan of Gene and Roy myself 🙂 Thanks for stopping by! I love the rundown of Latin-themed movies placed side-by-side, Jessica. This is a terrific overview of the players and era and a fantastic addition to the blogathon! Sadly I’m at work, but can’t wait to get in my car and play some of the music you mention. What fun!! THANK YOU for this! I have since learned that Lina Romay replaced Carmen Castillo at the Waldorf-Astoria in the 1940/41 time frame. I still do NOT have photographic documentation of Urbici Soler’s portrait of Carmen. I wrote to the Biblioteca Catalunya in Barcelona. They have no record of any such portrait. They are, however, the depository of most of Cugat’s papers and memorabilia. You MUST read Cugat’s biography, Rumba is my Life, to get the flavor of Latino life among the entertainment industry in mid-century. Cugat, as a cartoonist for the LA Times, was on assignment to sketch a caricature of Dolores del Rio on the set of her current movie project. Coogie (that’s how he spells it) saw the most beautiful woman he had ever seen on the set and assumed it was Ms del Rio. He started sketching her until he was informed that she was Ms del Rio’s understudy and that her name was . . . Carmen Castillo. Fascinating stuff !!! I need to see Charles Laughton dance. I love wearing Spanish and gypsy influenced clothing. Wonderful post. Cugat was one of my favorites during the band era of the 40s. Nice! I work in a record store on weekends, and I see his albums from time to time. Next shift, I’ll play some in the store!